On this last day before the elections, the afternoon light was waning in my Manhattan office and I thought I could be done fending off attacks on I-732, the Washington state carbon tax initiative. Not so fast. 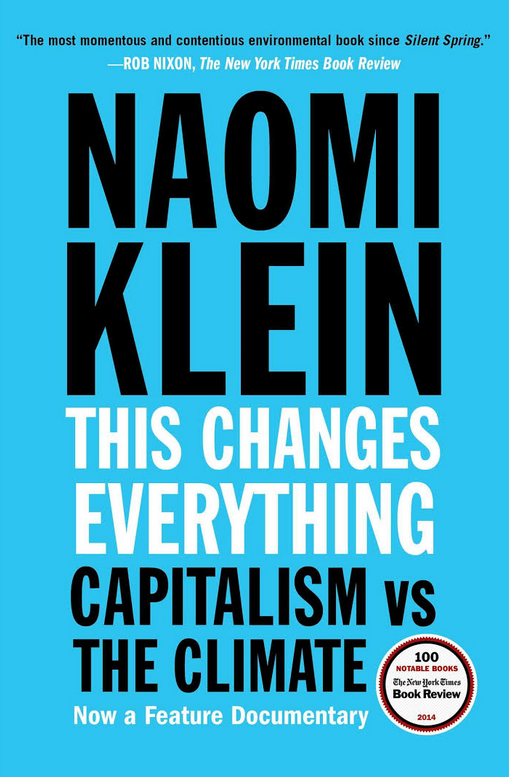 A CTC supporter wrote me, cryptically, “Naomi Klein should know better by now, no?” I checked Klein’s Twitter feed, @NaomiAKlein, and, uh oh, there it was: a piece by Klein in The Nation, The Carbon Tax on the Ballot in Washington State Is Not the Right Way to Deal With Global Warming. The policy that could do the most to start changing everything is on the ballot in Washington state. I read her piece. It’s mercifully brief, just ten paragraphs, so I thought I would let it go. But Klein, author most recently of This Changes Everything: Capitalism vs. The Climate, is charismatic, fluent and highly visible in the climate movement. And just about everything she said in her Nation piece is so misinformed or short-sighted that it feels important to respond. So here goes, in point-counterpoint. Klein Paragraph 1: The imperatives of the climate crisis and the logic of economic austerity are at war—and Washington State is on the front lines. Klein Paragraph 2: So-called “revenue-neutral” carbon pricing — whereby the proceeds are used to fund tax cuts — has long been a cherished hobbyhorse of free-market economists and the odd Republican who favors climate action. It’s also the policy of choice for big polluters like ExxonMobil. And now this right-wing friendly model is being pushed in Washington State, thanks to Initiative 732. CTC: “Tax cuts.” A percentage point cut in Washington’s state sales tax — the principal means by which I-732 ensures that raising energy prices through a carbon tax won’t injure low- and middle-income families — is dismissed as a mere “tax cut,” a phrase that of course conjures giveaways to the hedge-fund class. What Klein labels right-wing is actually friendly to and designed for the very groups she purports to care about: families below or near the poverty line; undocumented immigrants; over-leveraged folks struggling to stay middle-class. Klein Paragraph 3, abridged: [If I-732] is approved by voters, it would be a disastrous precedent that could set back the climate justice movement for a decade — time that we simply can’t afford to lose. CTC: Klein turns logic on its head. Following a decade of nearly total legislative silence on carbon taxes — a silence imposed not just by Republican denialists but by a myopic U.S. green movement — Klein frets that enacting an actual carbon tax in the USA and blowing open the door to a possible national carbon tax will set back climate action for another ten years? Klein Paragraph 4: Some have accepted the logic that something is better than nothing, even arguing that a “tax swap” could substitute for a just transition to a low-carbon economy. The evidence proves otherwise. In British Columbia, two-thirds of the tax cuts have ended up in corporate pockets, while carbon emissions have been rising in recent years and the fracking industry has boomed. CTC: By design, most of the BC carbon tax revenues end up in taxpayers’ pockets through personal income tax cuts as well as a low-income tax credit. A 2015 study by University of Ottawa graduate students found BC’s carbon tax “highly progressive” distributionally. In any case, I-732 is explicitly and intentionally structured differently, to apply 75 percent of carbon tax revenues to cut the Washington sales tax. Yes, CO2 emissions in British Columbia are up slightly since 2012, but that’s because the BC tax level has stayed fixed. In contrast, the Washington carbon tax would rise 3.5% a year faster than the general inflation rate. And If fracking has boomed in BC, don’t blame the province’s carbon tax for its lack of a keep-it-in-the-ground movement. CTC: Klein’s math is off; by 2040, the tax-caused rise in gasoline prices would be 25 percent. But the bigger point she ignores is that a carbon tax in any one state like Washington (or a lone province like British Columbia) can’t be set high because of interstate competitive pressures — which is also why I-732 sets aside 10-15 percent of its revenues for tax reductions for businesses like Boeing. The whole point of the Washington state initiative is to establish a template for other states or, if control of Congress can be flipped, for a national carbon tax that can rise briskly and deliver massive carbon reductions, as we noted in a blog post last month. Klein Paragraph 9: A paltry, revenue-neutral carbon tax simply cannot deliver the massive green energy investments and community-driven solutions we all need. Science-based climate action means an unprecedented, rapid, and decisive shift to renewables; a truly equitable carbon tax can play an important role in spurring the transition, but it won’t work unless we make the polluters pay, and put their immoral profits to work repairing the damage they have knowingly created. The way to do that is to mobilize the broadest possible coalition—led by the front-line communities who stand to benefit most from building a cleaner and fairer economy. CTC: Talk about “making polluters pay” is great rhetoric, but in our society as currently configured that includes all of us who flip on switches, turn on ignitions and buy stuff. And since the society we live in (to echo another post of mine last month) doesn’t appear to favor massive green energy investments and community-driven solutions, we have to rely even more heavily on robust carbon taxes; and these need to be largely revenue-neutral if they’re going to (i) not drive low-income families further into poverty and push middle-income families deeper into debt, and (ii) be politically acceptable. Klein’s call to put fossil fuel company profits to work repairing damages is more of the same empty rhetoric. The task before us is to shrink, shame and strangle the fossil fuel companies. If Klein can offer a way to do that more quickly and effectively than a briskly rising U.S. carbon tax — one that I-732 can start paving the way for — I’m all ears. Until then, could she please turn down the volume? 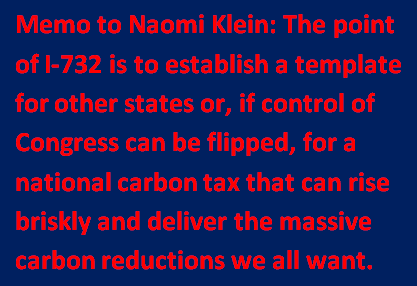 Addendum: CTC contributor Dan Lazare presciently dissected Klein’s limited comprehension of the power of carbon taxing almost two years ago, in this space, with Why Is Naomi Klein So Cool on a Carbon Tax? It’s a great read. If we accept the Klein urgency to reduce and eliminate fossil fuels, the only alternative to a carbon tax (given the slowness of installing a complete solar economy) is mandatory rationing and effiiency measures: give everyone a fixed allotment of gasoline or electricity or heating fuel, with annual reductions until fossil fuels are completely phased out. Of course by then, without other measures or a trillion dollar nationwide solar economy in place, you will have lots of cold dead hands. I haven’t seen any substantive proposal by Klein or others on the ditzy left come up with a substitute for a carbon tax. Incidentally for those absent from any environmental debate for the past forty five years, we activists have long demanded FULL COST PRICING so that the environmental and health costs of all goods and services are internalized in the sale price. A carbon tax is simply one kind of full cost pricing. Conclusion: the American left is still out to lunch on environment and energy issues: recused, deaf and hypnotized by ideology and dogma, without influence and adept only at shredding any idea that doesn’t arise from their shopworn doctrines. Good thing they don’t believe in electoral politics or we might be cursed by something as bad as Trump. Also responding to Klein para 9: Elon Musk, who arguably knows as much about getting clean energy to scale as anyone else alive, said last year at a meeting outside COP21: ““If countries agree to a carbon tax and it’s real and it’s not super watered down and weak we could see a transition [to clean energy] that has a 15- to 20-year timeframe as opposed to a 40- or 50-year timeframe, we could probably cut it in half and that would have a huge impact on the … welfare of the world … it really matters where we do this transition sooner or later.” He is calling for an effective price achieved fairly soon. I-732 would yield $46 a GHG ton in 2024 and $67 in 2030, plus inflation. Who but Klein would see this as a “paltry” achievement? She just doesn’t think clearly. How long before a ‘better deal’ comes along? It seems she enjoys the role of the scold, expecting us humans not to want stuff, eat less meat etc. Carbon tax takes us as we are, bargain seekers. I have read her book “This Changes Everything” and was utterly turned off. She says much that is correct. The trouble is that she lacks “this vision thing” that George H W Bush lamented lacking: She could also benefit from some humility.